Returns the bottom date of the valid range. Returns the top date of the valid range. The calendar provides navigation by month and year, and indicates the current day. 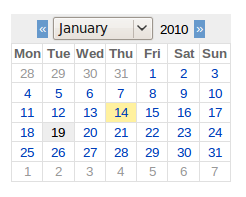 You can listen for single click or double click events on a calendar cell using the clicked() and activated() methods. The calendar may be configured to allow selection of single or multiple days using setSelectionMode(), and you may listen for changes in the selection using the selectionChanged() signals. Selection can also be entirely disabled in which case you can implement your own selection handling by listening for cell click events. Cell rendering may be customized by reimplementing renderCell(). Internationalization is provided by the internationalization features of the Wt::WDate class. Here is a snapshot, taken on 19/01/2010 (shown as today), and 14/01/2010 currently selected. Constructs a new calendar with English day/month names. The calendar shows the current day, and has an empty selection. Signal emitted when the user double-clicks a date. You may want to connect to this signal to treat a double click as the selection of a date. Displays the month which contains the given date. This does not change the current selection. This will emit the currentPageChanged() signal if another month is displayed. Browses to the next month. Displays the next month. This does not change the current selection. This will emit the currentPageChanged() singal. Browses to the same month in the next year. Displays the same month in the next year. This does not change the current selection. Browses to the previous month. Displays the previous month. This does not affect the selection. Browses to the same month in the previous year. Displays the same month in the previous year. This does not affect the selection. Clears the current selection. Will result in a selection() that is empty(). Signal emitted when the user clicks a date. You may want to connect to this signal if you want to provide a custom selection handling. Returns the current month displayed. Returns the month (1-12) that is currently displayed. Signal emitted when the current month is changed. The method is emitted both when the change is done through the user interface or via the public API. The two parameters are respectively the new year and month. Returns the current year displayed. Returns the year that is currently displayed. Returns the horizontal header format. Returns whether a date is selected. This is a convenience method that can be used when reimplementing renderCell(). Loads content just before the widget is used. 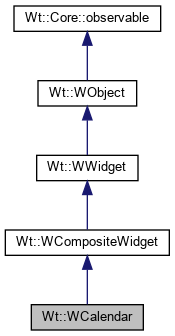 This method is called after a widget is inserted in the widget hierarchy and fully constructed, but before the widget is rendered. Widgets that get inserted in the widget hierarchy will be rendered. Visible widgets are rendered immediately, and invisible widgets in the back-ground (or not for a plain HTML session). This method is called when the widget is directly or indirectly inserted into the widget tree. The default implementation simply propagates the load signal to its children. You may want to override this method to delay loading of resource-intensive contents. During the life-time of a widget, this method may be called multiple times, so you should make sure that you do a deferred initializiation only once. Creates or updates a widget that renders a cell. You may want to reimplement this method if you wish to customize how a cell is rendered. When widget is 0, a new widget should be created and returned. Otherwise, you may either modify the passed widget, or return a new widget. If you return a new widget, the prevoius widget will be deleted. Select one date. Both in single or multiple selection mode, this results in a selection() that contains exactly one date. Select multiple dates. In multiple selection mode, this results in a selection() that contains exactly the given dates. In single selection mode, at most one date is set. Returns the set of dates currently selected. In single selection mode, this set contains 0 or 1 dates. Signal emitted when the user changes the selection. Emitted after the user has changed the current selection. Sets the bottom of the valid date range. The default is a null date constructed using WDate(). Sets the first day of the week. Possible values are 1 to 7. The default value is 1 ("Monday"). Sets the horizontal header format. The default horizontal header format is WCalendar::ShortDayNames. The default selection mode is SingleSelection. Configures the calendar to use single click for activation. By default, double click will trigger activate(). Use this method if you want a single click to trigger activate() (and the now deprecated selected() method). This only applies to a single-selection calendar. If selectionMode() is set to SingleSelection, this will cause the selection to change on a single click instead of a double click. Instead of enabling single click, you can also listen to the clicked() signal to process a single click. 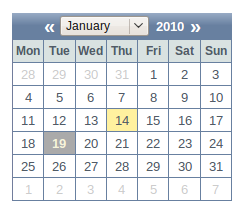 Sets the top of the valid date range.